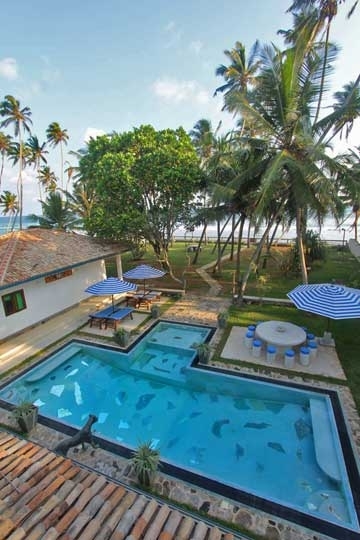 Located just eight kilometres from Galle, Mihiri House faces a striking stretch of south coast beach. 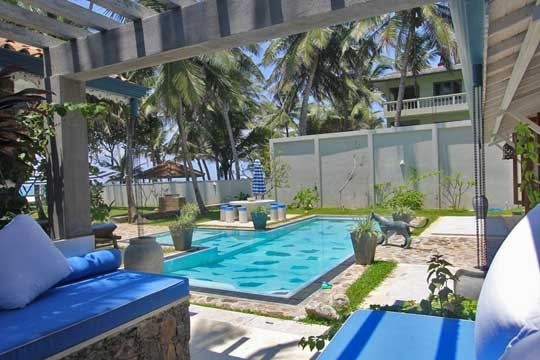 The bedrooms – three doubles and a twin – all have engaging sea views and the living space, also ocean-view, is huge. 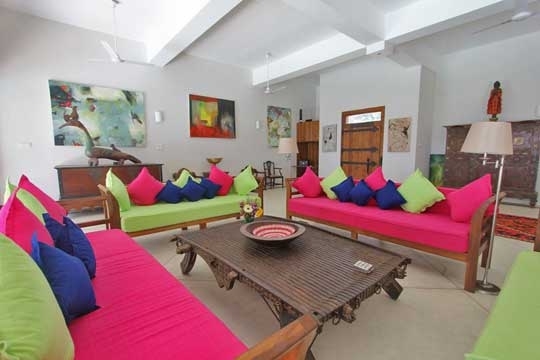 There’s no shortage of colour at this vibrant beach pad: daybeds are topped with lime, pink and navy blue cushions; sumptuous nooks are decked out in orange, saffron and azure; and bedroom blinds, curtains and bedspreads burst with cheeriness, mirroring the villa’s tropical seaside palette. 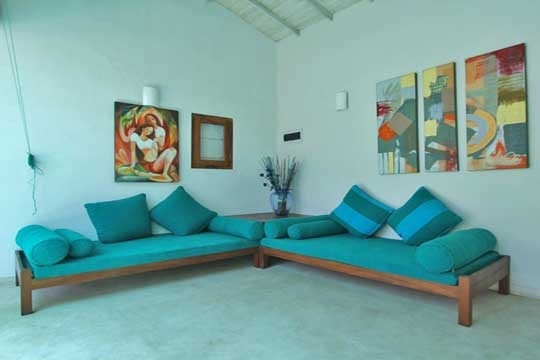 Modern artwork complements the ambiance, infusing the villa with warmth. 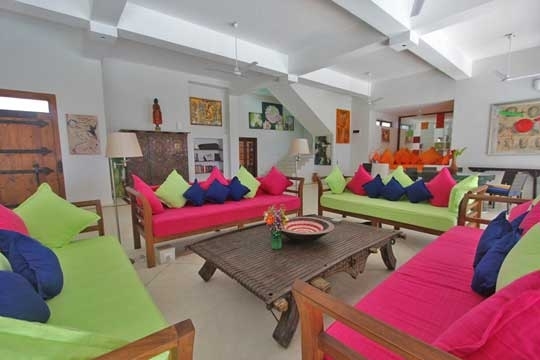 Mihiri House is as comfortable as it is colourful. 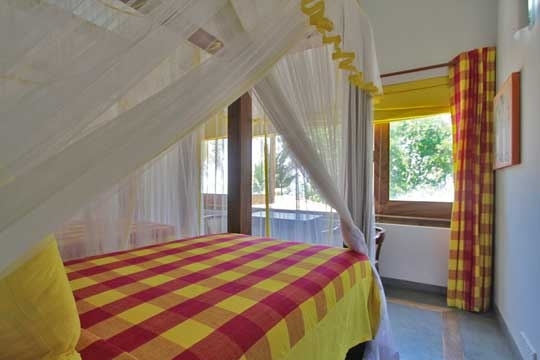 The cushions liberally scattering the villa are almost as thick as the mattresses in each of the cosy bedrooms. On the ground floor, a huge open-plan, sea-view living and dining room opens widely onto the pool terrace and features four cushioned day beds plus a cosy fan-cooled nook for hiding away with a novel. 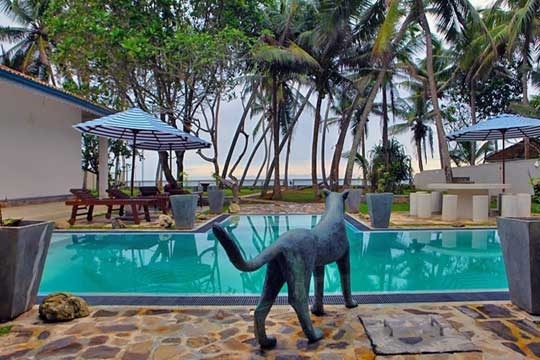 Just off the terrace is a comfortable pergola; here, you can slothfully soak up the sun’s warm rays in between dips in the swimming pool, over which a bronze panther – one of the owner’s creations – holds sway. On the first floor, there’s another, much quieter, lounging spot perfect for post-lunch snoozes. 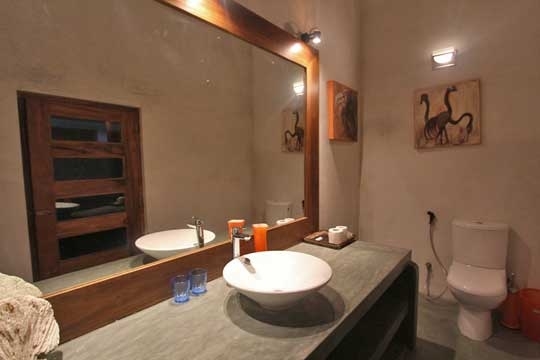 Dining venues at Mihiri House are also many and varied. 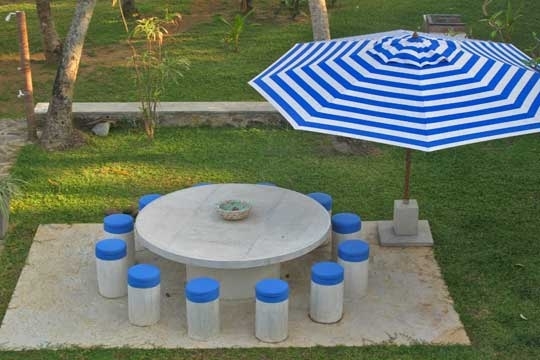 The main, indoor dining table seats up to ten, but there are two cement tables in the garden that offer wining and dining potential day or night. 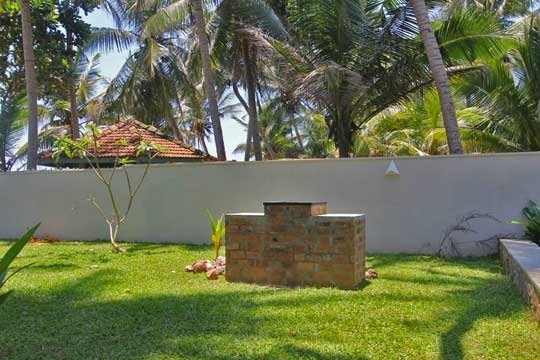 One is set beside the pool, conveniently close to the brick barbecue, and the other is at the far end of the garden, right beside the sea. The villa chef is one of a staff of four, and prepares meals from a suggestion menu including western and local cuisine. All food and drink is charged at cost price. 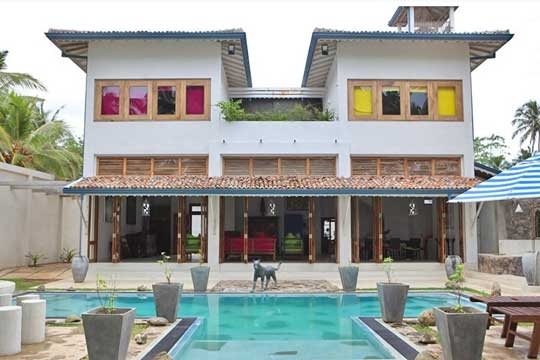 By staying at Mihiri House, you help the local community since ten per cent of your rent goes directly into a local charity called Children’s Hope, run by the villa’s British owner. The charity funds a variety of projects, including a residential school for deaf and blind kids, which guests are welcome to visit. 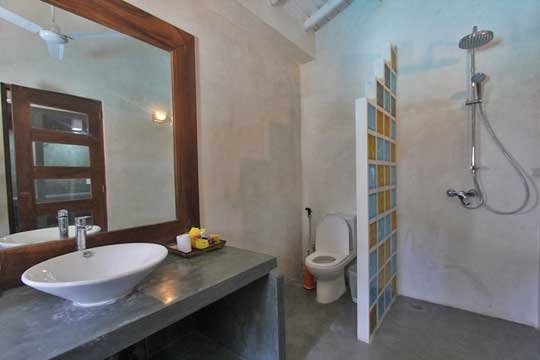 The zingy colour scheme is fab, as it really brings the interiors alive. 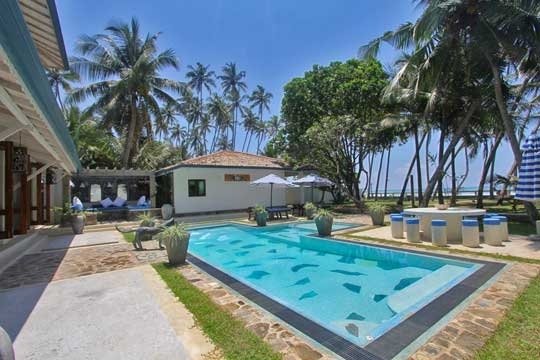 Located just a fifteen-minute drive south east of Galle in the picturesque fishing village of Mihiripena (after which the property was named) Mihiri House overlooks the deep blue of the Indian Ocean. Fishermen can often be seen casting their lines from the rocks just offshore whilst you can watch the many ships on the misty horizon from the comfort of a sunbed beside the pool. 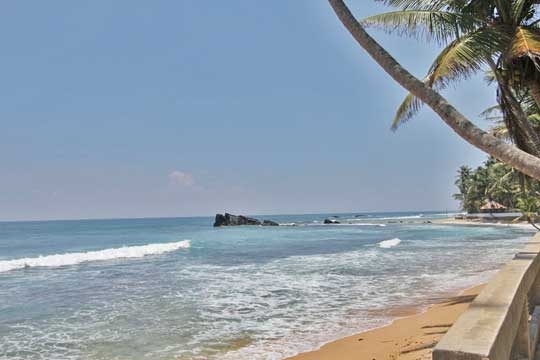 The nearest swimming beach, Dalawella, is just a five-minute walk west along the sand. Here, a wall of coral and rock offshore has created a tranquil turquoise lagoon that’s a favourite swimming spot for families. There’s a good beach restaurant is here too; think wood-fired pizzas, fresh seafood, sunset cocktails and a relaxed tropical ambiance. 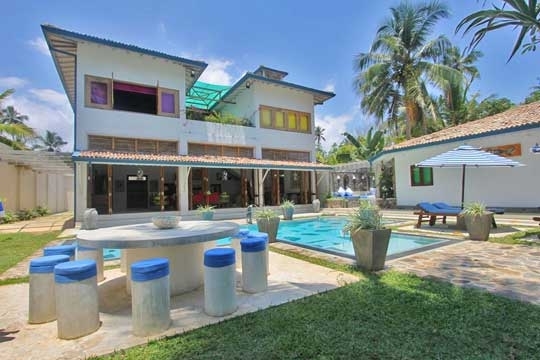 Whilst there are a few basic grocery shops within walking distance of Mihiri House, you’ll find supermarkets, money changing facilities, post offices and banks in historic Galle, which is easily accessible by three-wheeler or car. 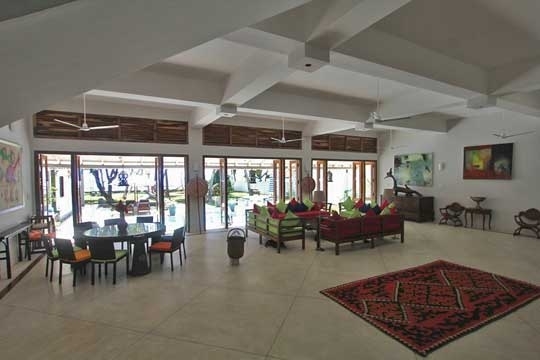 The ground floor of Mihiri House is almost entirely taken up by the expansive living and dining room, which opens via multiple sets of tall folding doors onto the pool terrace. The ceiling of this room is dotted with whirring fans and towers above a cream terrazzo floor. Furnishings include an antique Jaffna cupboard and a huge Dutch chest crowned by a giant carved bird while, at the heart of the room, four daybeds are padded in lime, pink and navy blue cushions. 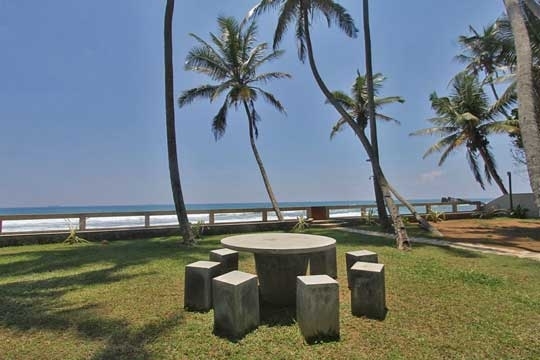 Beside them stands a circular glass-topped dining table for up to ten, with panoramic views out to sea. The chunky and unusual metal table base was once used to roll freshly plucked tea leaves in an upcountry factory. 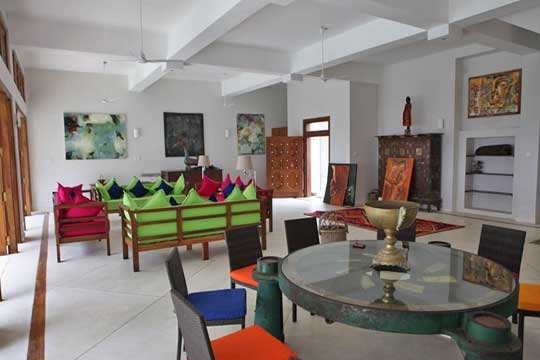 Around the living room, and indeed throughout the whole house, hang huge pieces of modern artwork – mostly painted by local artists. WiFi connection is good at the house and tucked into a cabinet to one corner of this room is a TV with satellite connection and DVD player, whilst to the opposite end is a deeply cushioned alcove for relaxing in during the heat of the day. 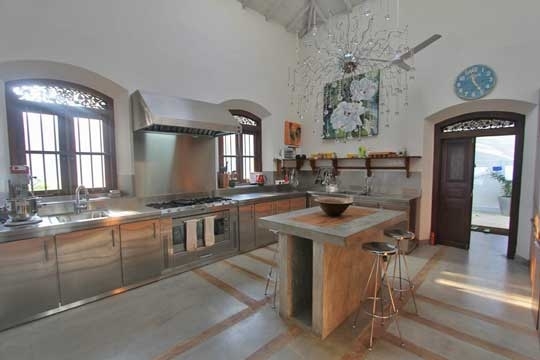 Behind the living room is an excellent fully equipped kitchen with six-burner hob and oven finished in stainless steel and a centre island worktop over which a chandelier elegantly cascades. 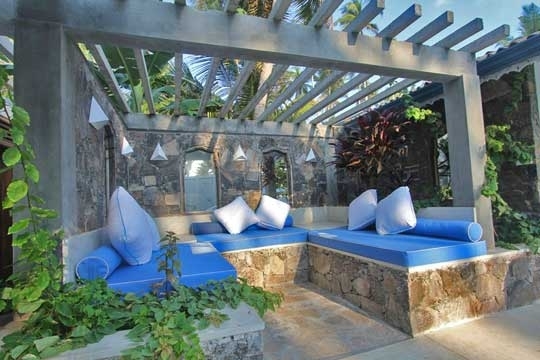 Overlooking the swimming pool, daybeds in the bougainvillea-draped pergola are decked out in blue and white cushions. 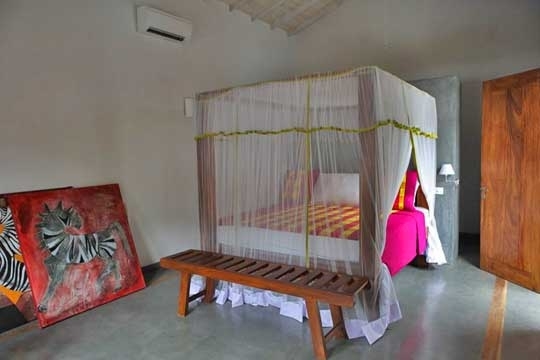 Mihiri House has four air-conditioned, colour-themed bedrooms; three with king-size and one with twin beds – all four-postered. 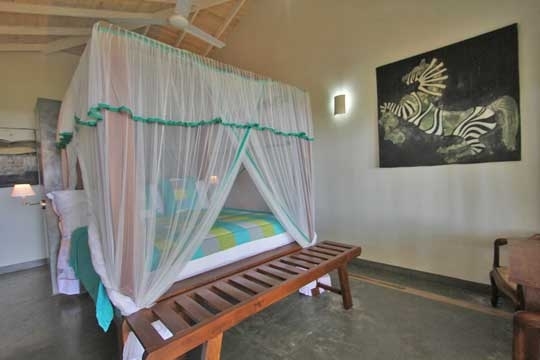 Each comes with direct sea views and ensuite bathrooms finished in smooth cement, ceiling fans and rain showers. Pink (the master bedroom) and Yellow (the twin) are on the upper floor, accessed via a staircase from the living room. Near-identical Green and Blue sit side-by-side in an annexe building to the front and open onto the garden. 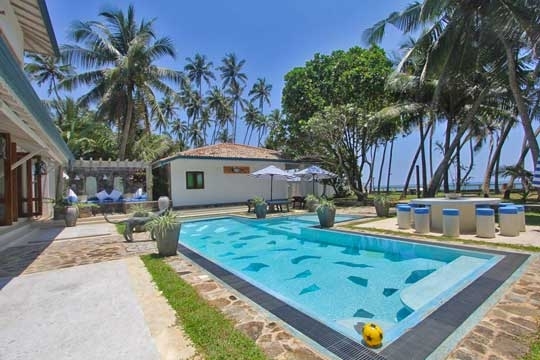 4 bedroom villa located in Galle, South Coast. Ideal for Beachfront, Body and soul, Bring the relatives, Kid friendly, Fair share for groups, Room with a view, Perfect for weddings.